For such a small island, Ireland has had a tremendous influence on Western culture, one that has nothing to do with guzzling green beer and pinching people every 17th of March. Ireland has given us tales of leprechauns and pots of gold, great literary minds like Yeats and Wilde and Joyce, and the oft-copied but never equaled anthems of four Dublin boys called U2. The contributions of Irish classical composers are a little less familiar to our cultural consciousness, however, but they are very much worth being heard. 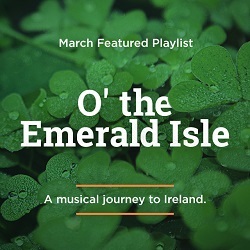 We encourage you to follow this aural rainbow to discover these glittering treasures O’ The Emerald Isle. 1. Ernest John Moeran – Violin Concerto: II. Rondo: Vivace. Alla valse burlesca – Moeran was born in England, but his father was Irish, and he lived there for much of his life. He may have technically been English and middle-class, but he was accepted, even well-liked, at the working-class pubs in Kenmare, Ireland, where he spent his later years. In fact, he even had a bar named in his honor, and it retained that name for 57 years after his death. 2. Archibald James Potter – Overture to a Kitchen Comedy – The title of this first orchestral composition by Archibald James Potter (no relation to Harry) might lead one to expect a percussion section made up of pots and pans. However, it refers to a type of low-budget stage play popular in Ireland at the time; imagine a cliché-ridden rom-com set entirely in one room (often a kitchen), and you’ll get the idea. 3. Charles Villiers Stanford – Symphony No. 3, “Irish”: II. Allegro molto vivace – Stanford composed seven symphonies, nine operas, and substantial choral works in the Anglican Church tradition, and he is remembered by some as part of a musical renaissance in the British Isles. However, it was his students Gustav Holst and Ralph Vaughan Williams who would go on to be one of his greatest legacies. 4. Mary Dickenson-Auner – Irish Symphony: II. Scherzo – Dickenson-Auner cultivated a dual career as both violinist and composer, though cultural biases of the day caused her to publish her first compositions under a male pseudonym. Her style, which she dubbed “Celtic Impressionism”, planted Irish folk tunes into unique ground somewhere between the music of J.S. Bach and Arnold Schoenberg’s 12-tone techniques. 5. Michael William Balfe – The Bohemian Girl, Act II: I Dreamt I Dwelt in Marble Halls – A protégé of Rossini’s, Balfe initially attempted a career as an opera singer. He went on to compose twenty-nine operas of his own. His operas were quite successful in his day, but the only one to remain in the repertoire to this day is The Bohemian Girl, composed in 1843. Here we’ve included its best-known aria performed by Dame Joan Southerland. 6. William Vincent Wallace – Maritana, Act III: Prayer: Sainted Mother, guide his footsteps – A gifted composer and multi-instrumentalist, Wallace moved his family to Australia, where he earned the nickname “the Australian Paganini”. In 1838 he abandoned his family there with a mountain of debt and spent seven years touring across New Zealand, India, and North and South America. He is mainly remembered today for his operas Maritana and Lurline. 7. Hamilton Harty – An Irish Symphony: The Twelfth Night – Besides being a composer of some success in his day, Harty was known as a talented conductor and valuable accompanist, even earning the nickname “the prince of accompanists”. As a conductor he helped bring the Hallé Orchestra back to respect, and he even led the London Symphony Orchestra for a couple years. 8. Victor Herbert – Cello Concerto No. 2: III. Allegro – Dublin-born Victor Herbert might be most remembered for operettas like Babes in Toyland, but he was also an accomplished cellist, and his Cello Concerto No. 2 has become a part of the instrument’s repertoire. The recording selected here stars only one of the most revered cellists to ever live, Yo-Yo Ma. 9. Arthur Duff – Echoes of Georgian Dublin: In College Green – Duff did a little bit of everything in his career, including performing, arranging, producing, conducting, and composing. He was friends with prominent musical figures of his day such as Arnold Bax and E.J. Moeran, and his best-known work, Echoes of Georgian Dublin, is based on the music of Dublin composers of the 18th century. 10. John Field – Nocturne No. 10 in E Minor – John Field is the pianist and composer credited with the invention of the nocturne as a piano composition, though the word “nocturne” may have been applied posthumously. His music was a primary influence on later greats of the piano, including Chopin, Schumann, and Liszt. His piano concertos were also quite a noteworthy step in the development of the genre. 11. Gerard Victory – 3 Irish Pictures: The Blacksmith – Victory’s career was primarily in music administration, which included fifteen years as Director of Music for RTÉ, Ireland’s public broadcasting station. Though little of it is recorded at this point, he composed over two hundred works, including symphonies, operas, and vocal music. His oeuvre encompasses tonal, aleatoric, serial, and electroacoustic styles. 12. John Kinsella – Symphony No. 4, “The Four Provinces”: III. Scherzo: Allegro molto – Kinsella has earned a reputation as Ireland’s most prolific composer of symphonies in the twentieth century. He also succeeded Gerard Victory as the Director of Music for RTÉ for a time, though his first love remained composition. His style initially was heavily based in serialism, but he later established his own idiom that shaped twelve-tone rows around a tonal center. 13. Eibhlis Farrell – Soundshock – Farrell composed this work for the Dublin Institute of Technology's concert band, but here it is recorded by the wind ensemble from Rutgers, where she earned her doctorate in composition. The work features a prominent bass drum ostinato, which she intends to represent the force and power of Ireland’s traditional Lambeg drum. 14. Donnacha Dennehy – That the Night Come: No. 1. He Wishes His Beloved Were Dead – Donnacha Dennehy wished to compose a song cycle for star soprano Dawn Upshaw, and he settled on texts by the Irish literary legend W.B. Yeats. Accompanying Upshaw is Crash Ensemble, a new-music collective which Dennehy co-founded. 15. Norman O’Neill – Carillon – O’Neill may have been born in London, but his parents were Irish, and his father was a celebrated painter whose seemingly sentimental images of children were sometimes seen as a Dickensian gesture of support for the poor. Alongside more standard fare, O’Neill the younger composed incidental music for over fifty plays, including those by Shakespeare, Barrie, and Maeterlinck. 16. Michael McGlynn – Behind the Closed Eye – Michael McGlynn is known primarily as the founder of Irish choral ensemble Anúna, and he composes or arranges most of their music. Established under the name An Uaithne in 1987, the ensemble was associated with Riverdance for a time, even performing it at the 1994 Eurovision Song Contest. The piece selected here was composed for a collaboration with the Ulster Orchestra. 17. James Moody – Little Suite: IV. Badinerie – It’s not often that we get to write this sort of thing, but James Moody is known for his compositions for the classical harmonica. He often collaborated with the harmonica player Tommy Reilly, and Reilly is the performer on the little work for soloist and orchestra selected here. Moody began his music career in an equally non-traditional manner, playing the piano for silent films when he was 13 years old. 18. Traditional – The Morning Dew / The Ivy Leaf – The harp is a staple instrument of traditional Irish music, and here it is joined by other Irish folk instruments, including the bodhran, the Uilleann pipes, and the dulcimer. This piece is a pairing of two well-known reels, “The Morning Dew” and “The Ivy Leaf”. 19. Anonymous – Office for St. Patrick’s Day, Matins, Part II: Responsory No. 8: Celestinus apostolicam tunc rexerat arcem – The Christian Church in Ireland has a very long and colorful history, and its musical roots are no less distinct and ancient. This plainchant from Medieval Ireland is accompanied by the clàrsach, a triangular harp with wire strings rather than the gut or nylon strings used on the orchestral harp. 20. Turlough Carolan – Carolan’s Farewell to Music – Harper Turlough Carolan (or O’Carolan) lived in the 17th and 18th centuries, and many consider him to be Ireland’s national composer. Blind since a bout of smallpox when he was eighteen, he made a celebrated career for himself traveling about Ireland to perform his songs, which he often composed in honor of wealthy patrons. Each month, Naxos Music Library presents a themed playlist for our subscribers to enjoy. We know that a database of over 1.75 million tracks can be a bit daunting, so we'd like to highlight some of the amazing music that is available to you. Let it kickstart discovery!